EMPORIA, Kansas, March 28, 2019 – – Emporia, Kansas will host the 17th annual Glass Blown Open (GBO) presented by Dynamic Discs. Event dates are April 20 – 27, with round one of tournament play beginning April 24th. GBO is the largest disc golf tournament celebration in the world and more than 2,000 players, Spectator Badge holders and volunteers are expected to participate this year. Disc golfers from ten countries and forty-seven U.S. states will flock to Emporia to compete in this highly anticipated event. Course venues for 2019 include the Emporia Country Club, Jones Park East, Jones Park West, Peter Pan Park, Municipal Golf Course, Hammond Park, Flint Hills Technical College, New Life Christian Church, all in Emporia and Olpe Lake; Swope Park, Cottonwood Falls; and Clover Cliff Ranch, Elmdale. In addition to tournament play, several activities and events are planned for the disc golfers during the week including C-Tier play, Hot Stamping at Dynamic Distribution, and Night Chains Glow Golf. Events open to the public during the week include Beer Fest presented by Radius Brewing Co., on Monday, April 22, from 5:00 – 8:00 pm, Comedy Night presented by KISS 103.1 and 99.5 ESPN at the Emporia Granada Theatre on Wednesday, April 24, from 8:00 – 10:00 pm, and a Swedish Bonfire at the Lyon County Fairgrounds on Friday, April 26, from dusk to 11:00 pm. The Glass Blown Open culminates Saturday evening with a block party celebration in the 800 and 900 blocks of Commercial Street and includes the GBO Vendor Village, Ring of Fire, Putting Championship Finals, and food and beverage vendors. Awards will be presented in front of the Dynamic Discs retail store, 912 Commercial Street, at approximately 5:00 pm. 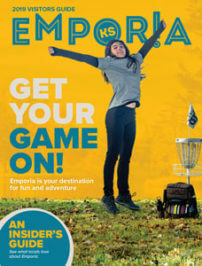 The Emporia Convention & Visitors Bureau is a destination marketing organization that promotes Emporia to potential visitors and meeting planners and serves as the visitor information center for Emporia with additional print information about the surrounding area and the State of Kansas. www.visitemporia.com.